Summer is here! And that means it’s time to shop for swimsuits. But if you’re like most women, finding a swimsuit that flatters your body can be tough. Lucky for you, many companies are designing swimsuits to flatter your unique body while making you feel confident at the same time. Here are a few tips on what styles to buy for your body type this summer! Try to stick to tops that flatter you while keeping you supported at the same time. Stay away from ruffles and wild print and stick to solid colors and simple patterns. By doing this, you’ll be able to draw less attention to your bust and feel confident in your skin! This top from Albion fit will look perfect on you. Your curvy hips are nothing to be ashamed of! Accentuate your curves by wearing a high waisted bottom to shape your hips and make sure your body is best flattered. High waisted bottoms will also make you feel modest and confident! These swim bottoms from Aire are perfect for your curvy hips. Your small body is beautiful and you deserve to show it off! Patterns, bright colors and ruffles will bring attention to your body! So stick with the things that make you feel confident but also give you a nice figure. This suit from Albion fit is going to give you the attention you need in all the right places. You have the ability to flaunt the length of your legs and torso! The suit that will flatter you most is a stylish one-piece. This will accentuate your torso while also showing off your long legs. Stick to one-pieces that flatter your length rather than shorten you. V-necks and open backs will do the trick! Here is a stylish one-piece from Cupshe. Your height is nothing to be ashamed of! Your cute figure is best flattered when you wear styles that lengthen your torso and legs. Halter tops and high waisted bottoms will do the trick for you! 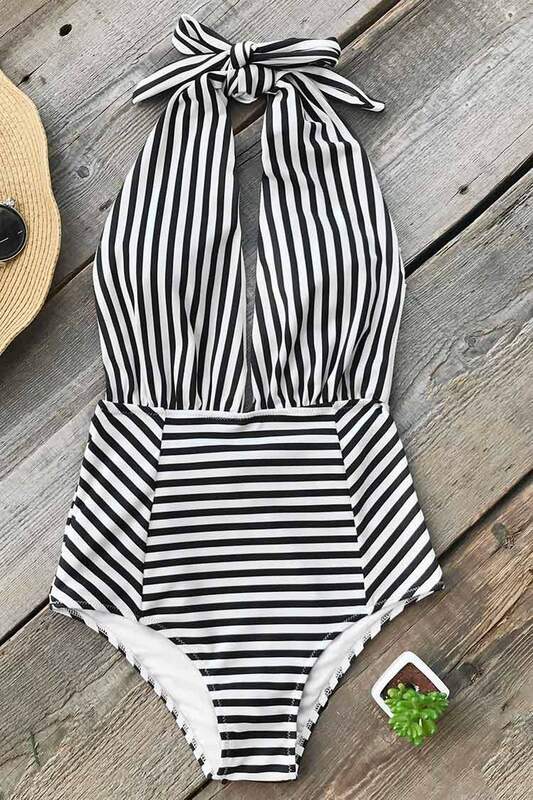 This suit from Albion fit will flatter your cute body! Anything that will bring attention to your bust will flatter you! Wild patterns and ruffles are the styles that will make you feel confident. You don’t need to make your bust look bigger, you just need to flatter your top in the right way! This ruffle top from Nordstrom will give you a nice figure on top! Trying to stay modest and cute while at the beach can be hard, but high necks ad high waisted bottoms are coming into style now, so lucky for you! You don’t have to wear a covering one-piece in order to feel confident. Instead, try on this cute high neck, high waisted suit from Albion fit! If your style and body type is more sporty, there are so many suits that will be right for you! Stick with styles that give you the right coverage, and support so you can be your sporty self while you show off your beach bod! This gorgeous suit from Albion fit will definitely give you that sporty look while also making you feel confident. No matter what your body type is, feel confident in your skin! Nothing is more stylish than a confident woman, so show off your body the way it is! Keep these tips in mind so you can best flatter your figure, and look good while doing it! BTW, you may also interesting in reading 7 Tips for Pool-Ready Beauty, also if you need to buy Swimming Pool Loungers, check out this post. All these suits are from Albion Fit, Aire, Cupshe and Nordstrom.